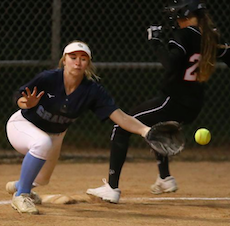 ANAHEIM (4-5-2019) – Granite Hills High, one of four CIF San Diego Section ballclubs invited to the prestigious Michele Carew Classic, finished pool play in a 3-way tie in Group F after all three teams split their ballgames. However, based on run differential, the Eagles will advance into the Silver Division for second-place teams instead of the Gold Division championship round. Granite Hills opened the event with a 5-4 victory over Yucaipa. However, when the Eagles lost Thursday’s (Apr. 4) night game to Huntington Beach, 6-5, it was Yucaipa which advanced by virtue of the Thunderbirds’ decision over H-Beach, 8-4 on Wednesday at Peralta Canyon Park. GRANITE HILLS 5, YUCAIPA 4: Trailing 3-0 on a series of unearned runs, the Eagles answered with a run in the 4th, then three more in the 5th on a Haley Johnson home run to capture a contest called after six frames (tournament time limit). Staci Chambers pitched a 2-hitter to stop the T-Birds, striking out five batters. The comeback started in station-to-station fashion, With one out, Amaya Esparza singled, Morgan Kelly walked, then Sydney Huse singled to left to load the bases. Brooke Bertussi followed with a liner to left to score Esparza to trim the deficit to 3-1. An inning later, with Baily Wallace (single) and Rylee Omahen (safe on error) on base, Johnson belted a one-out homer to center field for the victory. Chambers then closed out the victory with a 1-2-3 inning for Granite Hills (12-4). Yucaipa fell to 9-4. HUNTINGTON BEACH 6, GRANITE HILLS 5: Moments after the Eagles tied the contest in the top of the 6th (and final) inning, the Oilers answered with a walk-off run. 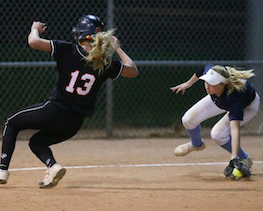 With two runners in scoring position, an intentional walk loaded the bases, then a ground ball by Katelyn Mangrello turned into a play at the plate, but the Oilers runner was ruled safe. Granite Hills rallied from deficits of 4-2 and 5-4 to get even. In the 5th, a bases-loaded and an error allowed the Eagles to get even. An inning later, Granite Hills again got even on an error, a walk another error. The Oilers defensive mistakes made the loss all the more frustrating because the Eagles thought they made a strong play to at least forge a pool-play tie, only to see the final play at the plate go the other way. Granite Hills (11-5) saw Chambers record two of the team’s six hits. Surf City went to 12-7, yet is headed to the Bronze Division for third-place teams.